The Tythe Stone at the side of Twirl Hill Road. 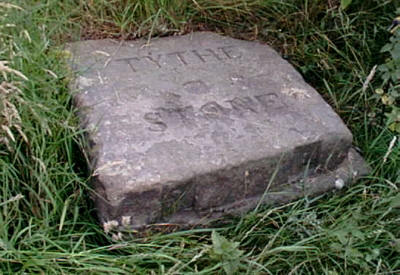 Lying at the side of a lane below Hartshead Pike is an ancient stone at one time known as the "Twarl Stone". 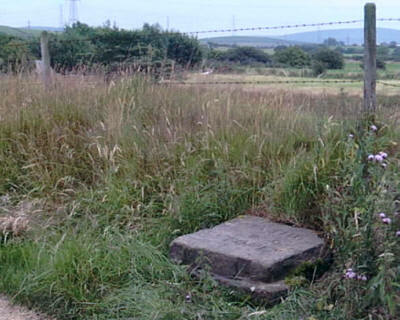 This is an ancient tithe stone, situated in the area once known as Twarl Hill or Twirl Hill. This unlikely, out-of-the-way location was once a meeting place, at a time when the area was almost completely agricultural. The stone was between the hamlets of Hartshead and Alt. At that time the ancient parish of Ashton extended to Mossley and Austerlands so the stone would have been a central point for the northern parts of the parish. Deatail of the lettering carved on the Tythe Stone. Tithes were paid as a kind of tax, paid to the parish, comprising one tenth of what the farmer produced. There were tithe barns at Cricketts Lane, Audenshaw and Luzley for the storage of the goods paid over. Farmers would go to this stone twice a year to hand over their tithes.